Slower health care spending has helped buy Medicare more time before it will no longer be able to pay out 100% of benefits. But the program is still facing significant funding shortfalls. A report released Friday by the trustees of Medicare and Social Security projects the magnitude of those shortfalls over the near- and long-term. Medicare Part A, which covers hospital costs for seniors, is financed primarily by payroll taxes paid by workers. But since 2008 those revenues haven't kept pace with the program's costs. The federal government has made up the difference by both paying interest on assets in the Medicare trust fund and redeeming the assets themselves. But that Medicare trust fund will be exhausted by 2026, the trustees estimated. Last year, the report put the date of insolvency at 2024. 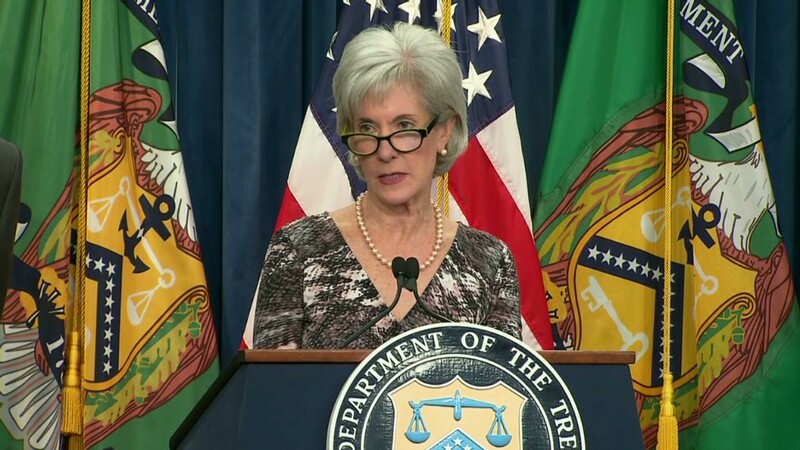 "The Medicare report demonstrates, once again, the importance of the Affordable Care Act, which has strengthened Medicare's finances by reining in health care costs," said Treasury Secretary Jacob Lew. Economists looking at the slowdown in health spending growth say it's still unclear how much of the slowdown is due to the implementation of health reform and how much is attributable to the slow economy of the past few years. Robert Reischauer, one of the two public trustees of Medicare and Social Security, said it would be "a mistake" to interpret the two-year extension of solvency in the Medicare trust fund as "significant." Medicare projections involve a great deal of uncertainty, because several factors can influence future spending patterns, Reischauer said. Among them: congressional legislation, new medical technologies and developments in the private health sector and the insurance market. If nothing is done, the revenue coming into Medicare Part A will be able to cover just 87% of expected costs after 2026. By the middle of the century, it will only cover about 70%. To give a sense of how large that long-run shortfall is, the trustees estimate that to match the program's income to its costs over the next 75 years, the Medicare tax would need to be raised immediately to 4.01% on all wages, up from 2.9% today. Or Medicare benefits would need to be cut by 23%. Medicare Part B, which covers doctor visits, and Medicare Part D, which covers prescription drug costs, are financed primarily through premiums paid by seniors and by general federal revenue. Neither has a trust fund. As program costs have risen, however, premiums have covered a smaller share. Consequently, general revenue today covers roughly 75% of Part B costs. Going forward, the cost of Part B is projected to rise from 2% of GDP last year to 3.3% by 2035. In terms of Social Security, the trustees estimate the trust fund exhaustion date will be 2033, the same as their estimate last year. At that point the program will be able to pay 77% of promised benefits through 2087. Closing the long-range shortfall in Social Security would require the equivalent of immediately raising the Social Security tax to 15.12%, up from 12.4% today. Or Social Security benefits would need to be cut by 17%. Of most immediate concern, however, is the disability trust fund, which has an estimated exhaustion date of 2016. After that, revenue would only be able to pay 80% of disability benefits, according to the trustees. So Congress will need to act soon to shore up disability funding. 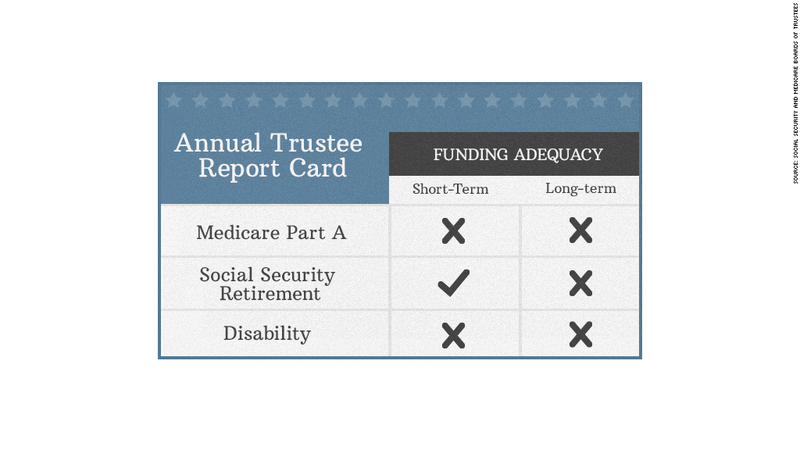 Social Security actuaries have proposed two solutions. One is to divert payroll taxes away from the retiree benefit portion of Social Security. Of the 12.4% workers and employers pay into Social Security, 1.8% is earmarked for disability. Lawmakers could, for instance, increase the share going toward disability payments to 2.6% for two years and then slowly cut it back to 1.8% by 2030. Or they could raise the 1.8% disability tax rate to 2.2%. That would keep the disability fund solvent for 75 years. But debates over entitlement reform so far are any indication, agreeing on a solution will be a tough slog.